Whether you’re in a moody or a beachy vibe, Florence knows just how to fit your style! As a minimalist theme, it’s incredibly versatile, letting you adjust it however you need. 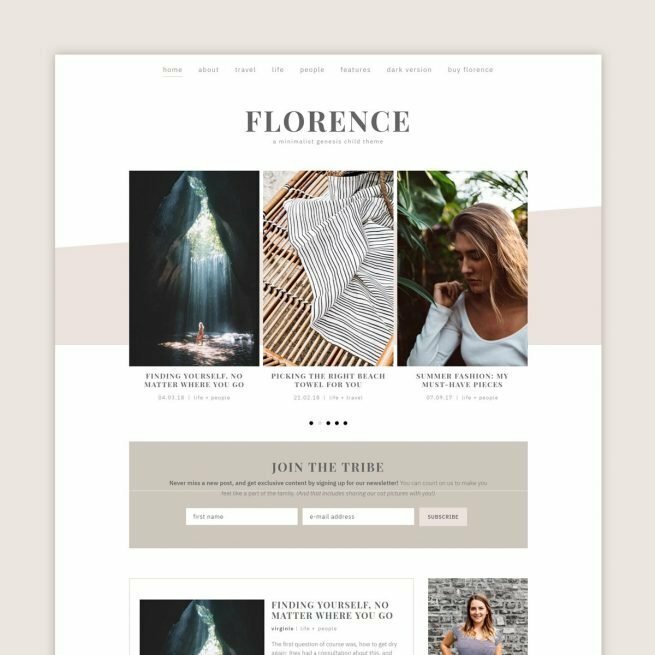 Florence is a gorgeous WordPress theme you’ll have no problem installing on your website. In just a few clicks, you’ll have it look just like the demo and will be ready to blog! Use the full power of the new Gutenberg editor! Florence is optimized to look as good in the editor as it looks on the page. All the blocks have been styled to fit the rest of the website, so you can easily create pages instead of fumbling with code. Plugins are an amazing way to add functionality to a website! We have a few favorites, and made sure to integrate them with Florence! Simple Social Icons, Instagram Feed and Jetpack are a few of those! Lifetime updates of the Florence theme.